Benedict Cumberbatch plays an eccentric, lonely, possibly autistic genius who uses his gifts to help people who he looks down upon, save only for a companion who serves as his foil and link to the outside world. Remarkably though, it’s not Sherlock, but a real-life hero, whose contribution to the Allies winning World War II and his subsequent life are a rich enough vein of drama without the need for embellishment. As I’m sure you all know, Cumberbatch plays Alan Turing, a brilliant mathematician who succeeds in academia but is severely lacking in social skills. His Manchester dwelling has been ransacked, and he’s sitting in a police station talking to an officer (Rory Kinnear) who is wondering why nothing was taken during the burglary. Turing starts to talk – he was recruited by Commander Denniston (Charles Dance) to help break Enigma, the machine which encoded all German messages sent over the air during the second World War. It’s seemingly unbreakable, Turing says during their first meeting. “Let me try, and we’ll know for sure”, he proffers. The film jumps back and forth between wartime and 1952, as the police gradually become more interested in this eccentric figure, and the secrets he holds. Although there is obviously a heavy focus on the actual codebreaking, it’s done in such a way that even the most techno-illiterate will be able to keep up. 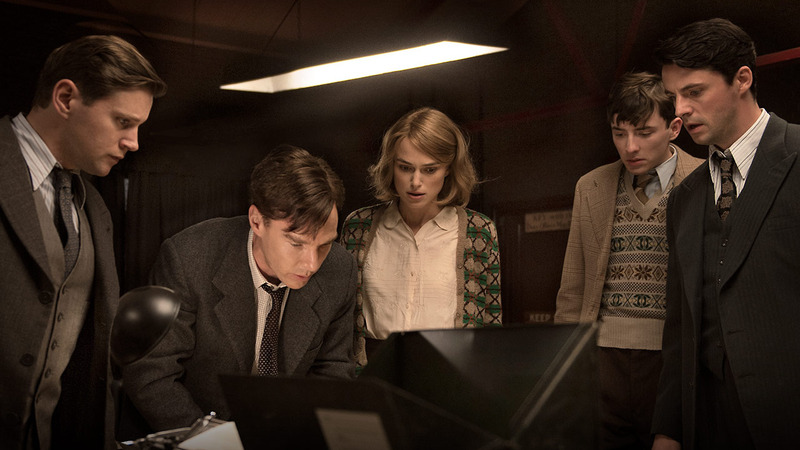 Even more impressively, it is always rooted in what’s at stake – the human cost of the Bletchley Park team’s failure to crack Enigma is constantly driven home, even to the seemingly unfeeling Turing, who develops a human side once a recruitment drive sees Joan Clarke (Keira Knightley) arrive. She is of a similar intellect, but with added social skills, and she helps him falteringly take his first steps into becoming part of a team that she is excluded from by default because of her gender. Even though he has made progress, Turing is excluded from society as a whole; he was later, of course, one of the most famous gay men to be prosecuted for gross indecency at a time when homosexuality was still illegal in the UK. This secret threatens his livelihood, and Cumberbatch plays the part well as a man living inside a disguise which is barely passable. The supporting cast is also excellent – Charles Dance is a suitably venerable war commander, while Mark Strong shows a rare lightness of touch as MI6 contact Stewart Menzies. The Bletchley Park team are excellent – the scene where they crack Enigma, only to realise they can’t do anything with the information they now possess, is engrossing and well-acted. This is a funny, sad, smart, gripping film which will leave you thinking well after you exit the cinema, if only about how far back we as a civilisation were set back by our own prejudices and ignorance. In a season full of stand-out films so far, The Imitation Game definitely deserves to be in the mix come awards time. Sounds good, probably will go see it in next week or two. Thought it was outstanding – found it hard to fault it, Cumberbatch was superb, Dance, Strong also great, the whole cast was great. The score is stunning as well.